Counter-Signals is a bi-annual journal addressing, in variable iterations, different aspects of the intersection of design, media, and politics. 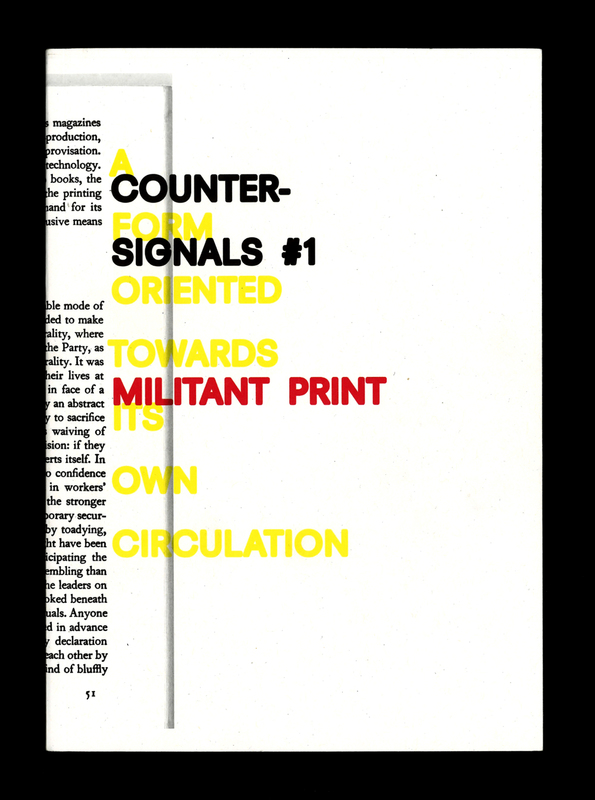 The first issue — Militant Print / A Form Oriented to Its Own Circulation — documents and theorizes forms of militant aesthetics in the history of self-organized print publishing … among other things. The issue includes contributions from Mladen Dolar, Katharina Stadler, Thomas Fisher, Emma Holmes, Danielle Aubert, Mary Ikoniadou, T’ai Smith, Lucy Mulroney, Eirik Steinhoff, Nasrin Himada and Denise Ferreira da Silva, Léo Favier, Nicolás Pradilla, Alan Smart, Nasrin Tabatabai and Babak Afrassiabi, Josh Macphee, and Lewis Mumford.